Organizations that transform their applications to cloud-optimized architectures need a seamless, end-to-end continuous delivery and deployment workflow: from source code, to build, to deployment, to software delivery. Continuous delivery is a DevOps software development practice where code changes are automatically built, tested, and prepared for a release to production. The practice expands on continuous integration by deploying all code changes to a testing environment and/or a production environment after the build stage. When continuous delivery is implemented properly, developers will always have a deployment-ready build artifact that has undergone a standardized test process. Continuous deployment is the process of deploying application revisions to a production environment automatically, without explicit approval from a developer. This process makes the entire software release process automated. Features are released as soon as they are ready, providing maximum value to customers. These two techniques enable development teams to deploy software rapidly, repeatedly, and reliably. In this post, we will build an end-to-end continuous deployment and delivery pipeline using AWS CodePipeline (a fully managed continuous delivery service), AWS CodeDeploy (an automated application deployment service), and TeamCity’s AWS CodePipeline plugin. We will use AWS CloudFormation to setup and configure the end-to-end infrastructure and application stacks. The ­­pipeline pulls source code from an Amazon S3 bucket, an AWS CodeCommit repository, or a GitHub repository. The source code will then be built and tested using TeamCity’s continuous integration server. Then AWS CodeDeploy will deploy the compiled and tested code to Amazon EC2 instances. You’ll need an AWS account, an Amazon EC2 key pair, and administrator-level permissions for AWS Identity and Access Management (IAM), AWS CloudFormation, AWS CodeDeploy, AWS CodePipeline, Amazon EC2, and Amazon S3. Continuous integration server setup using TeamCity. Continuous deployment using AWS CodeDeploy. 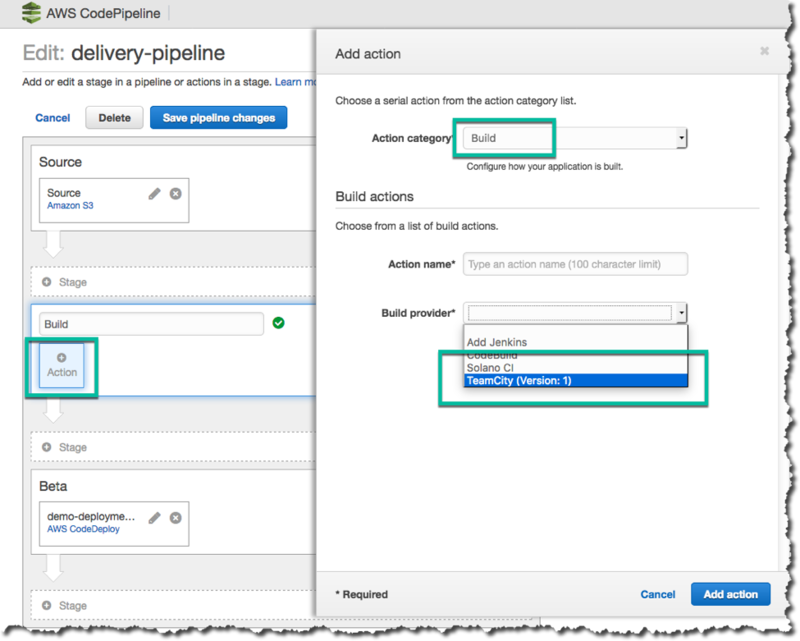 Building a delivery pipeline using AWS CodePipeline. In less than an hour, you’ll have an end-to-end, fully-automated continuous integration, continuous deployment, and delivery pipeline for your application. Let’s get started! 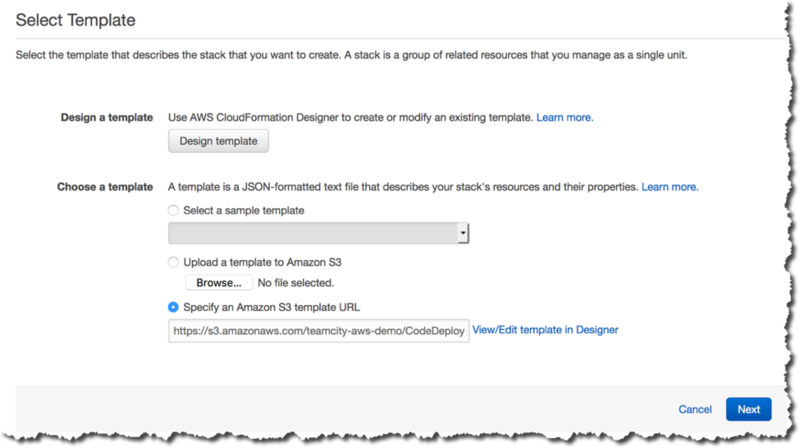 Click here on this button to launch an AWS CloudFormation stack to set up a TeamCity server. If you’re not already signed in to the AWS Management Console, you will be prompted to enter your AWS credentials. 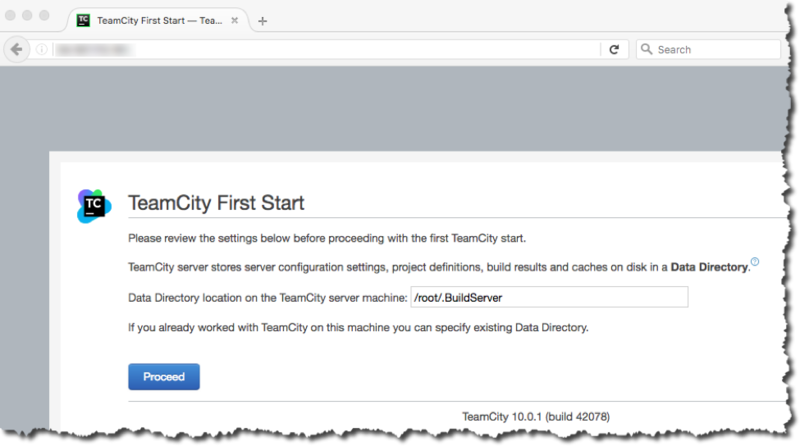 This stack provides an automated way to set up a TeamCity server based on the instructions here. You can download the template used for this setup from here. Installs and configures the TeamCity server and its dependencies in Linux. 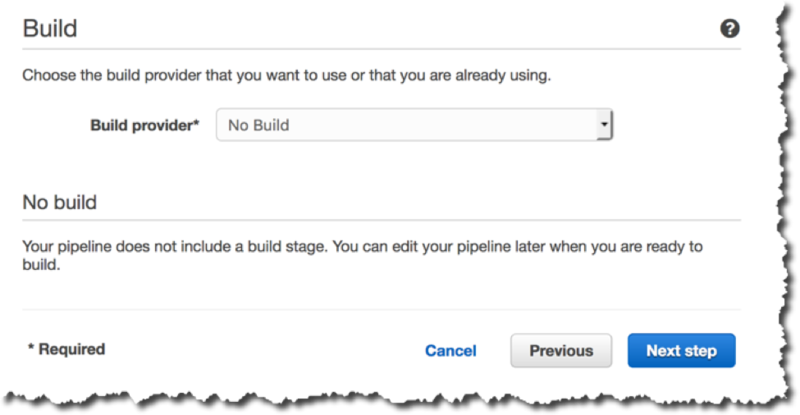 Installs the AWS CodePipeline plugin for TeamCity. Installs a sample application with build configurations. Installs PHP meta-runners required to build the sample application. Redirects TeamCity port 8111 to 80. Choose the AWS region where the TeamCity server will be hosted. For this demo, choose US East (N. Virginia). On the Select Template page, choose Next. In Stack name, enter a name for the stack. The name must be unique in the region in which you are creating the stack. In InstanceType, choose the instance type that best fits your requirements. The default value is t2.medium. Note: The default instance type exceeds what’s included in the AWS Free Tier. If you use t2.medium, there will be charges to your account. The cost will depend on how long you keep the CloudFormation stack and its resources. 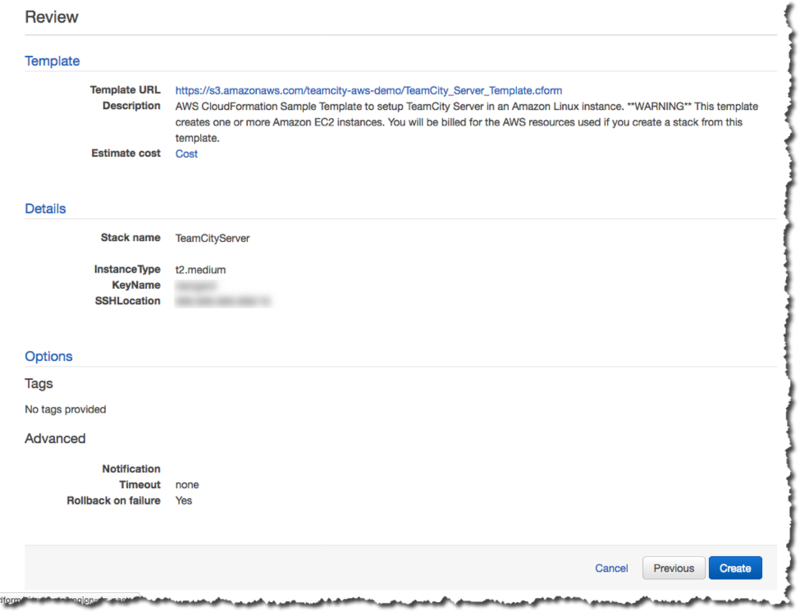 In KeyName, choose the name of your Amazon EC2 key pair. In SSHLocation, enter the IP address range that can be used to connect through SSH to the EC2 instance. SSH and HTTP access is limited to this IP address range. Note: You can use checkip.amazonaws.com or whatsmyip.org to find your IP address. Remember to add /32 to any single domain or, if you are representing a larger IP address space, use the correct CIDR block notation. Although it’s optional, on the Options page, type TeamCityServer for the instance name. This is the name used in the CloudFormation template for the stack. It’s a best practice to name your instance, because it makes it easier to identify or modify resources later on. On the Review page, choose Create button. It will take several minutes for AWS CloudFormation to create the resources for you. When the stack has been created, you will see a CREATE_COMPLETE message on the Overview tab in the Status column. You have now successfully created a TeamCity server. To access the server, on the EC2 Instance page, choose Public IP for the TeamCityServer instance. On the TeamCity First Start page, choose Proceed. Although an internal database based on the HSQLDB database engine can be used for evaluation, TeamCity strongly recommends that you use an external database as a back-end TeamCity database in a production environment. An external database provides better performance and reliability. For more information, see the TeamCity documentation. On the Database connection setup page, choose Proceed. The TeamCity server will start, which can take several minutes. Review and Accept the TeamCity License Agreement, and then choose Continue. Next, create an Administrator account. Type a user name and password, and then choose Create Account. You can navigate to the demo project from Projects in the top-left corner. Note: You can create a project from a repository URL (the option used in this demo), or you can connect to your managed Git repositories, such as GitHub or BitBucket. The demo app used in this example can be found here. We have already created a sample project configuration. Under Build, choose Edit Settings, and then review the settings. 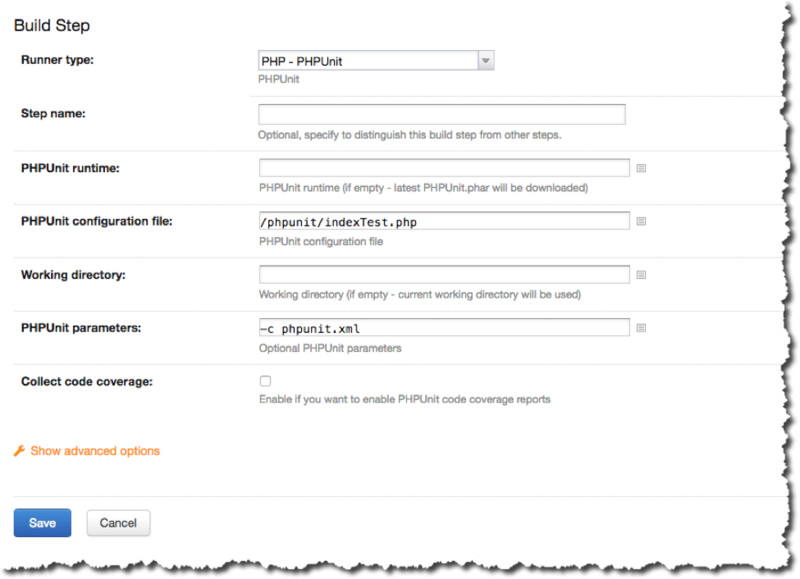 Choose Build Step: PHP – PHPUnit. The fields on the Build Step page are already configured. Choose Run to start the build. To review the tests that are run as part of the build, choose Tests. You can view any build errors by choosing Build log from the same drop-down list. 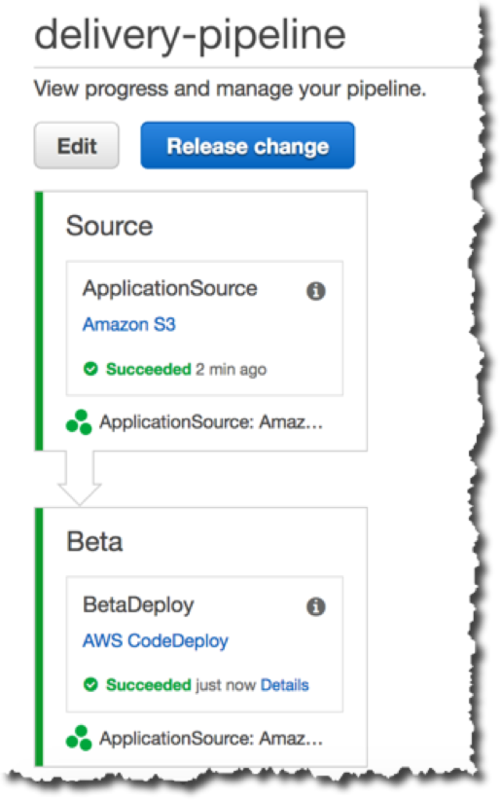 Now that we have a successful build, we will use AWS CodeDeploy to set up a continuous deployment pipeline. 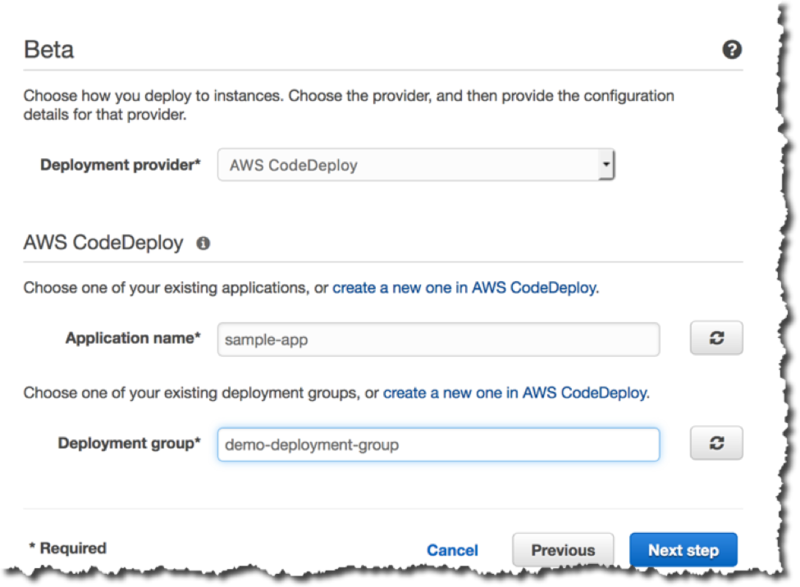 Click here on this button to launch an AWS CloudFormation stack that will use AWS CodeDeploy to set up a sample deployment pipeline. 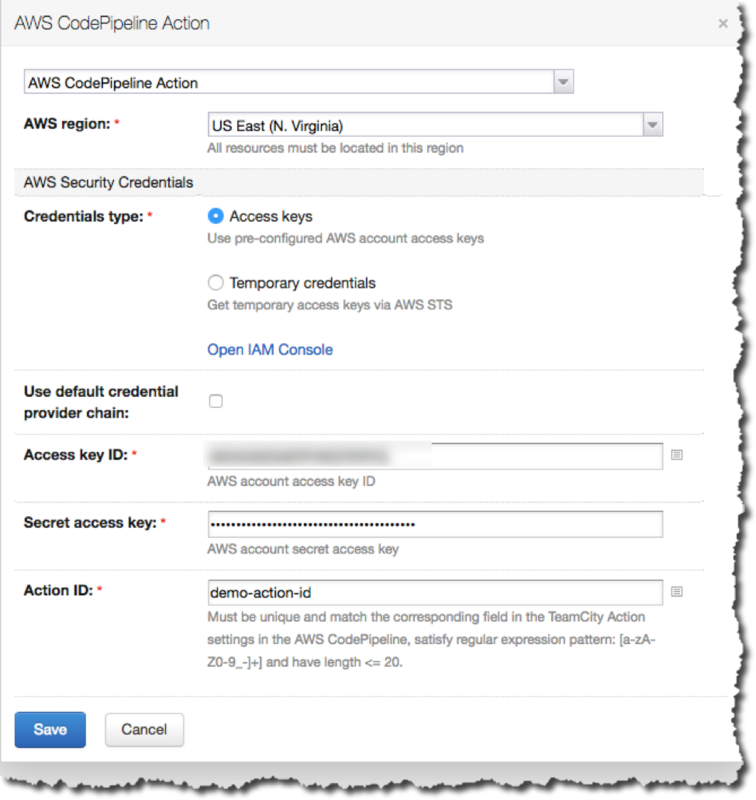 If you’re not already signed in to the AWS Management Console, you will be prompted to enter your AWS credentials. You can download the master template used for this setup from here. The template nests two CloudFormation templates to execute all dependent stacks cohesively. Template 1 creates a fleet of up to three EC2 instances (with a base operating system of Windows or Linux), associates an instance profile, and installs the AWS CodeDeploy agent. The CloudFormation template can be downloaded from here. 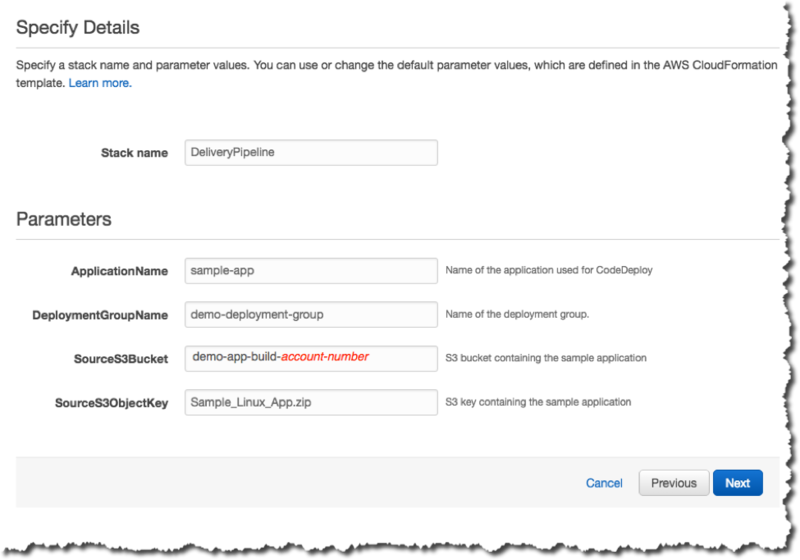 Template 2 creates an AWS CodeDeploy deployment group and then installs a sample application. The CloudFormation template can be downloaded from here. 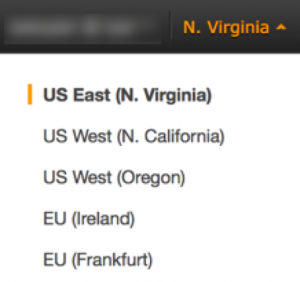 Choose the same AWS region you used when you created the TeamCity server (US East (N. Virginia)). Note: The templates contain Amazon Machine Image (AMI) mappings for us-east-1, us-west-2, eu-west-1, and ap-southeast-2 only. In AppName, you can use the default, or you can type a name of your choice. The name must be between 2 and 15 characters long. It can contain lowercase and alphanumeric characters, hyphens (-), and periods (. ), but the name must start with an alphanumeric character. In DeploymentGroupName, you can use the default, or you type a name of your choice. The name must be between 2 and 25 characters long. It can contain lowercase and alphanumeric characters, hyphens (-), and periods (. ), but the name must start with an alphanumeric character. In InstanceType, choose the instance type that best fits the requirements of your application. In InstanceCount, type the number of EC2 instances (up to three) that will be part of the deployment group. For Operating System, choose Linux or Windows. Leave TagKey and TagValue at their defaults. AWS CodeDeploy will use this tag key and value to locate the instances during deployments. For information about Amazon EC2 instance tags, see Working with Tags Using the Console. In S3Bucket and S3Key, type the bucket name and S3 key where the application is located. The default points to a sample application that will be deployed to instances in the deployment group. Based on what you selected in the OperatingSystem field, use the following values. In SSHLocation, enter the IP address range that can be used to connect through SSH/RDP to the EC2 instance. Follow the prompts, and then choose Next. On the Review page, select the I acknowledge that this template might cause AWS CloudFormation to create IAM resources check box. Review the other settings, and then choose Create. It will take several minutes for CloudFormation to create all of the resources on your behalf. The nested stacks will be launched sequentially. You can view progress messages on the Events tab in the AWS CloudFormation console. You can see the newly created application and deployment groups in the AWS CodeDeploy console. To verify that your application was deployed successfully, navigate to the DNS address of one of the instances. Now that we have successfully created a deployment pipeline, let’s integrate it with AWS CodePipeline. We will now create a delivery pipeline in AWS CodePipeline with the TeamCity AWS CodePipeline plugin. Using AWS CodePipeline, we will build a new pipeline with Source and Deploy stages. Create a custom action for the TeamCity Build stage. 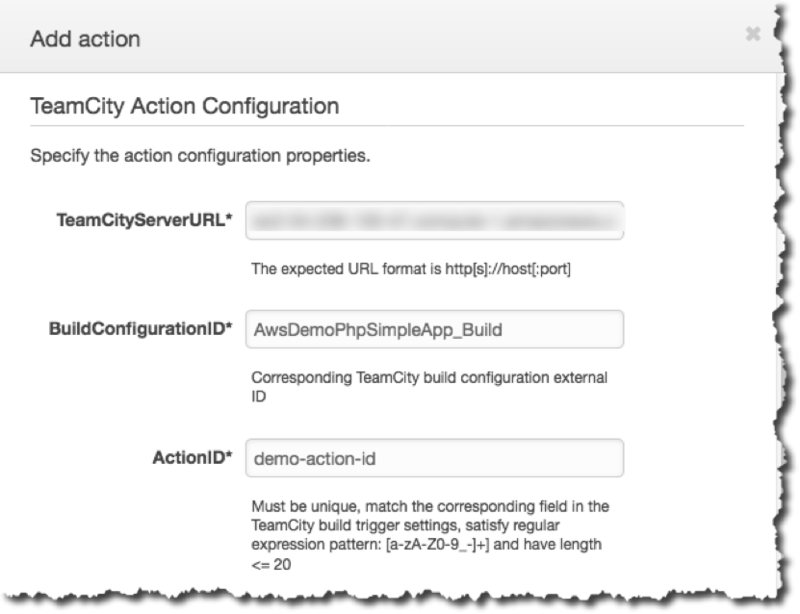 Create an AWS CodePipeline action trigger in TeamCity. 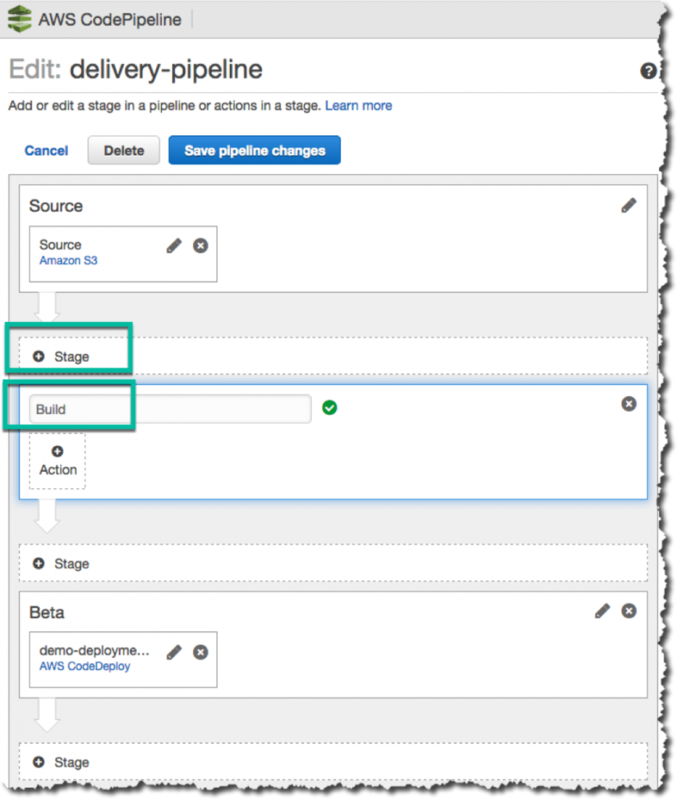 Create a Build stage in the delivery pipeline for TeamCity. 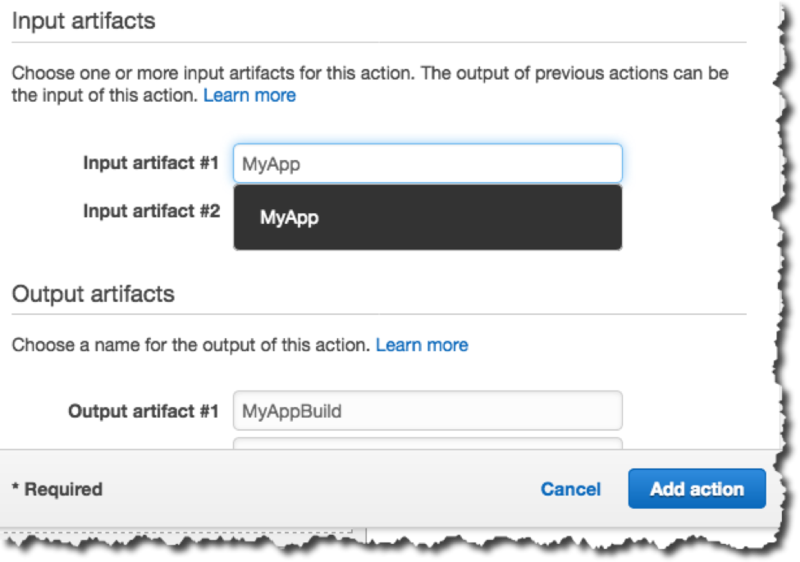 Publish the build artifact for deployment. 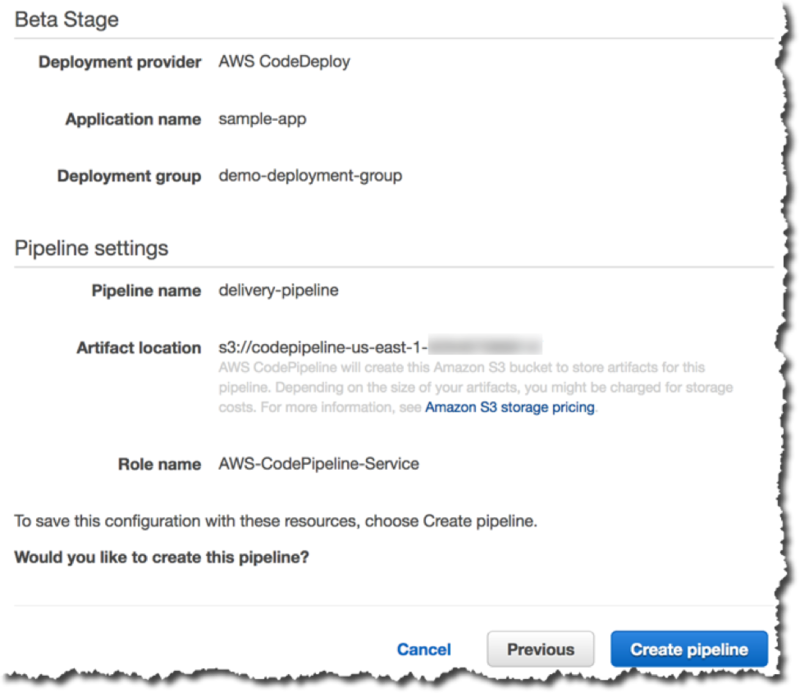 Step 1: Build a new pipeline with Source and Deploy stages using AWS CodePipeline. In this step, we will create an Amazon S3 bucket to use as the artifact store for this pipeline. 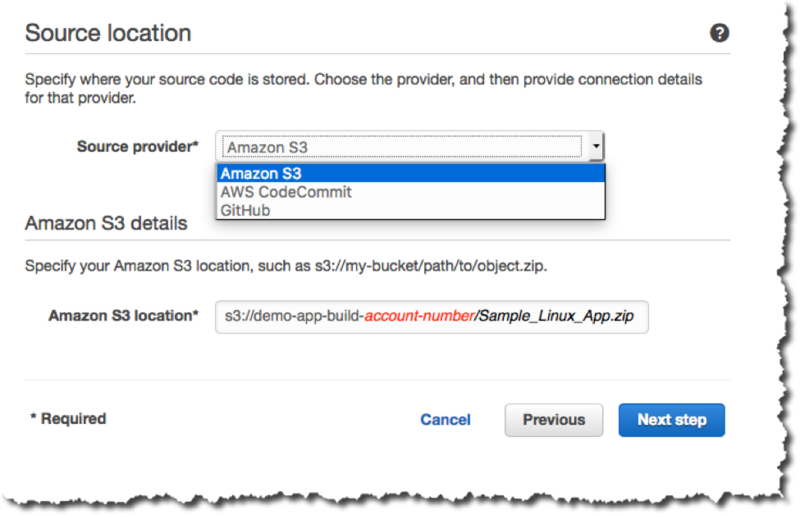 Create an Amazon S3 bucket that will host the build artifact. Replace account-number with your AWS account number in the following steps. 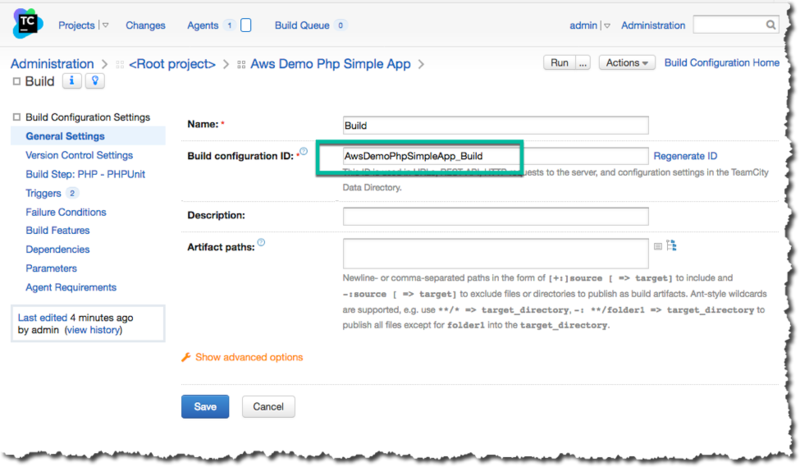 Download the sample build artifact and upload it to the Amazon S3 bucket created in step 2. 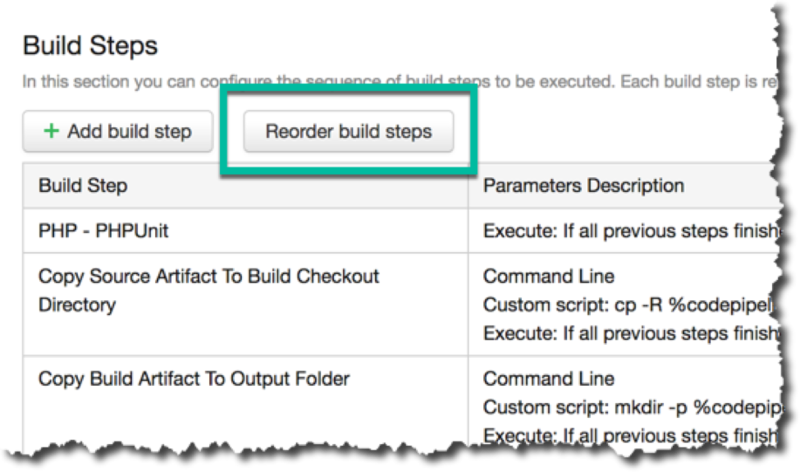 Note: You can use AWS CloudFormation to perform these steps in an automated way. When you choose , this template will be used. Use the following commands to extract the Amazon S3 bucket name, enable versioning on the bucket, and copy over the sample artifact. $ export bucket-name ="$(aws cloudformation describe-stacks --stack-name “S3BucketStack” --output text --query 'Stacks.Outputs[?OutputKey==`S3BucketName`].OutputValue')"
You can create a pipeline by using a CloudFormation stack or the AWS CodePipeline console. Click here on this button to launch an AWS CloudFormation stack to set up a new delivery pipeline using the application and deployment group created in an earlier step. If you’re not already signed in to the AWS Management Console, you will be prompted to enter your AWS credentials. Choose the US East (N. Virginia) region, and then choose Next. Leave the default options, and then choose Next. Select the I acknowledge that AWS CloudFormation might create IAM resources check box, and then choose Create. This will create the delivery pipeline in AWS CodePipeline. On the Create pipeline page, in Pipeline name, type a name for your pipeline, and then choose Next step. Depending on where your source code is located, you can choose Amazon S3, AWS CodeCommit, or GitHub as your Source provider. The pipeline will be triggered automatically upon every check-in to your GitHub or AWS CodeCommit repository or when an artifact is published into the S3 bucket. In this example, we will be accessing the product binaries from an Amazon S3 bucket. Note: AWS CodePipeline requires a versioned S3 bucket for source artifacts. Enable versioning for the S3 bucket where the source artifacts will be located. On the Build page, choose No Build. We will update the build provider information later on. For Deployment provider, choose CodeDeploy. For Application name and Deployment group, choose the application and deployment group we created in the deployment pipeline step, and then choose Next step. 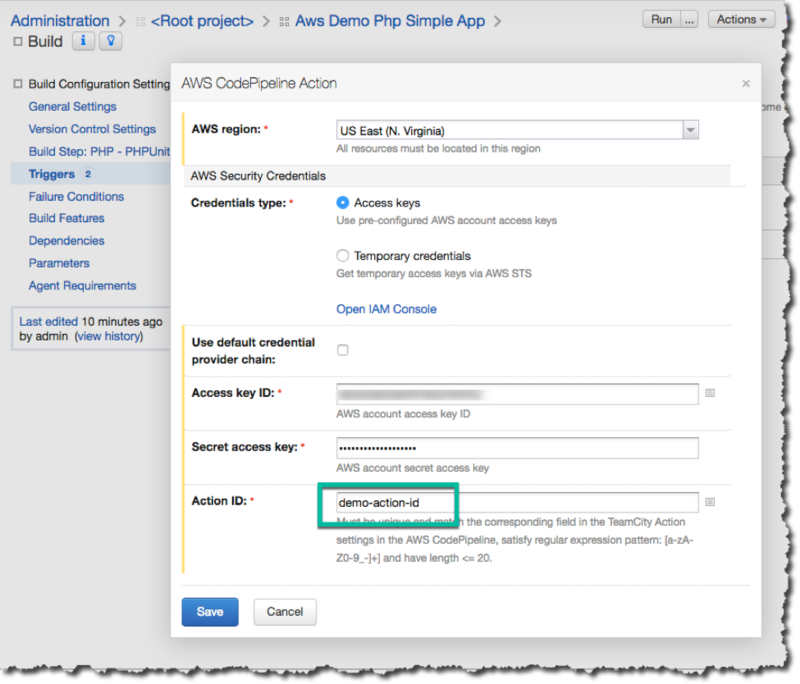 An IAM role will provide the permissions required for AWS CodePipeline to perform the build actions and service calls. If you already have a role you want to use with the pipeline, choose it on the AWS Service Role page. Otherwise, type a name for your role, and then choose Create role. Review the predefined permissions, and then choose Allow. Then choose Next step. For information about AWS CodePipeline access permissions, see the AWS CodePipeline Access Permissions Reference. This will trigger AWS CodePipeline to execute the Source and Beta steps. The source artifact will be deployed to the AWS CodeDeploy deployment groups. 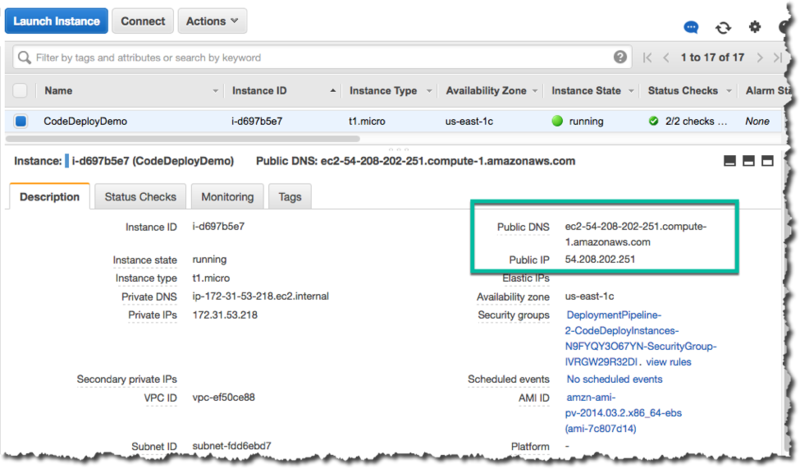 Now you can access the same DNS address of the AWS CodeDeploy instance to see the updated deployment. You will see the background color has changed to green and the page text has been updated. We have now successfully created a delivery pipeline with two stages and integrated the deployment with AWS CodeDeploy. Now let’s integrate the Build stage with TeamCity. 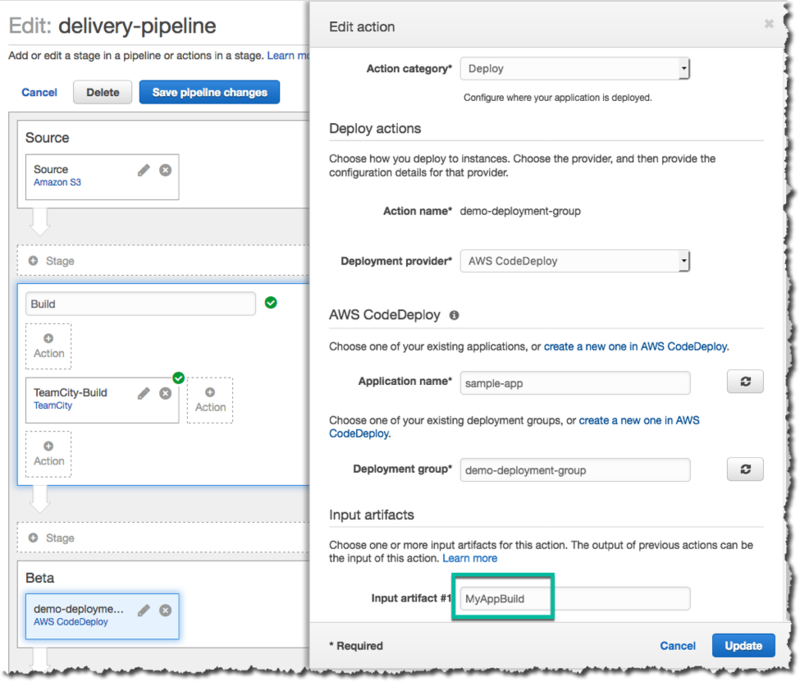 AWS CodePipeline includes a number of actions that help you configure build, test, and deployment resources for your automated release process. TeamCity is not included in the default actions, so we will create a custom action and then include it in our delivery pipeline. TeamCity’s CodePipeline plugin will also create a job worker that will poll AWS CodePipeline for job requests for this custom action, execute the job, and return the status result to AWS CodePipeline. 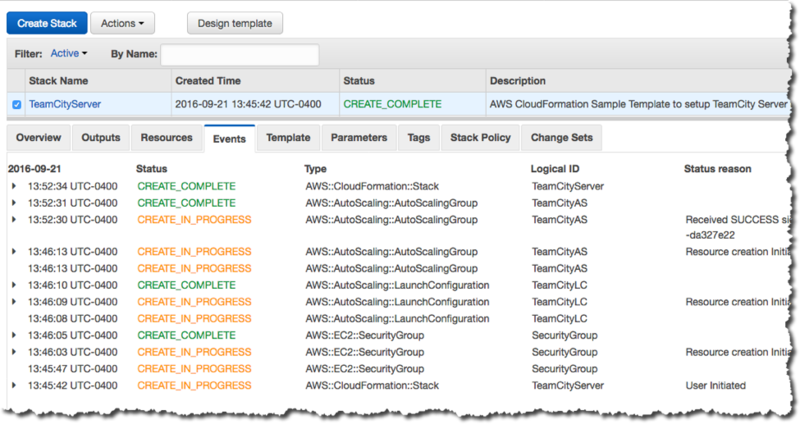 TeamCity’s custom action type (Build/Test categories) can be integrated with AWS CodePipeline. It’s similar to Jenkins’ custom actions. TeamCity’s CodePipeline plugin will also create a job worker that will poll AWS CodePipeline for job requests for this custom action, execute the job, and return the status result to AWS CodePipeline. The TeamCity AWS CodePipeline plugin is already installed on the TeamCity server we set up earlier. To learn more about installing TeamCity plugins, see install the plugin. We will now create a custom action to integrate TeamCity with AWS CodePipeline using a custom-action JSON file. Open a terminal session (Linux, OS X, Unix) or command prompt (Windows) on a computer where you have installed the AWS CLI. For information about setting up the AWS CLI, see here. Use the AWS CLI to run the aws codepipeline create-custom-action-type command, specifying the name of the JSON file you just created. Before you add the custom action to your delivery pipeline, make the following changes to the TeamCity build server. 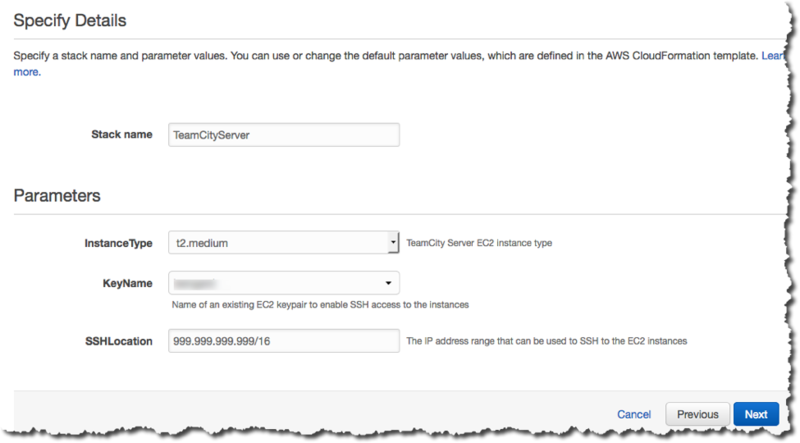 You can access the server by opening the Public IP of the TeamCityServer instance from the EC2 Instance page. In TeamCity, choose Projects. Under Build Configuration Settings, choose Version Control Settings. You need to remove the version control trigger here so that the TeamCity build server will be triggered during the Source stage in AWS CodePipeline. Choose Detach. 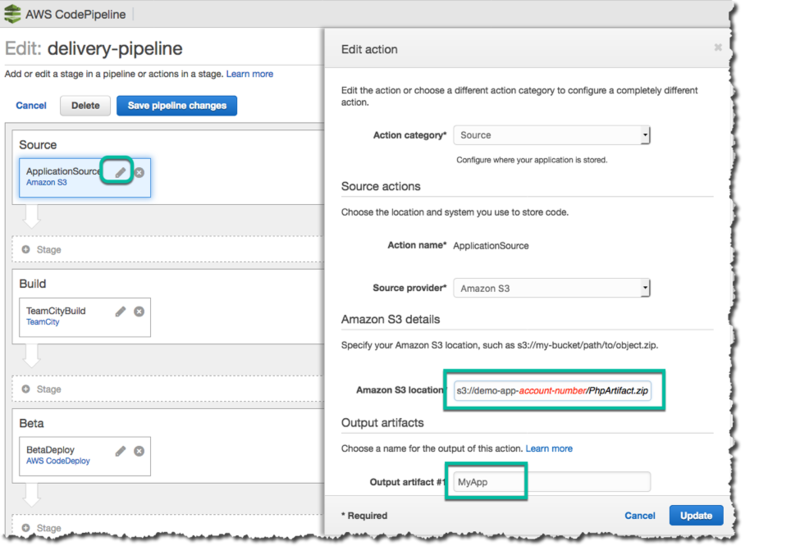 From the drop-down menu, choose AWS CodePipeline Action. In the AWS CodePipeline console, choose the region in which you created your delivery pipeline. Enter your access key credentials, and for Action ID, type a unique name. You will need this ID when you add a TeamCity Build stage to the pipeline. Add a stage to the pipeline and name it Build. From the drop-down menu, choose Build. In Action name, type a name for the action. In Build provider, choose TeamCity, and then choose Add action. BuildConfigurationID: In your TeamCity project, choose Build. You’ll find this ID (AwsDemoPhpSimpleApp_Build) under Build Configuration Settings. ActionID: In your TeamCity project, choose Build. You’ll find this ID under Build Configuration Settings. 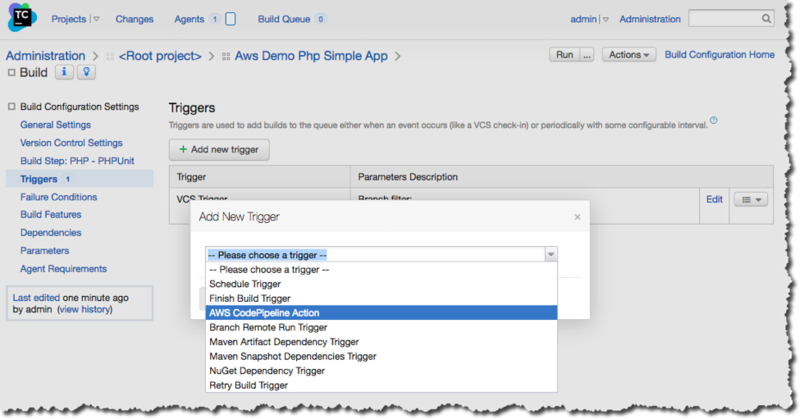 Choose Triggers, and then choose AWS CodePipeline Action. Next, choose input and output artifacts for the Build stage, and then choose Add action. We will now publish a new artifact to the Amazon S3 artifact bucket we created earlier, so we can see the deployment of a new app and its progress through the delivery pipeline. 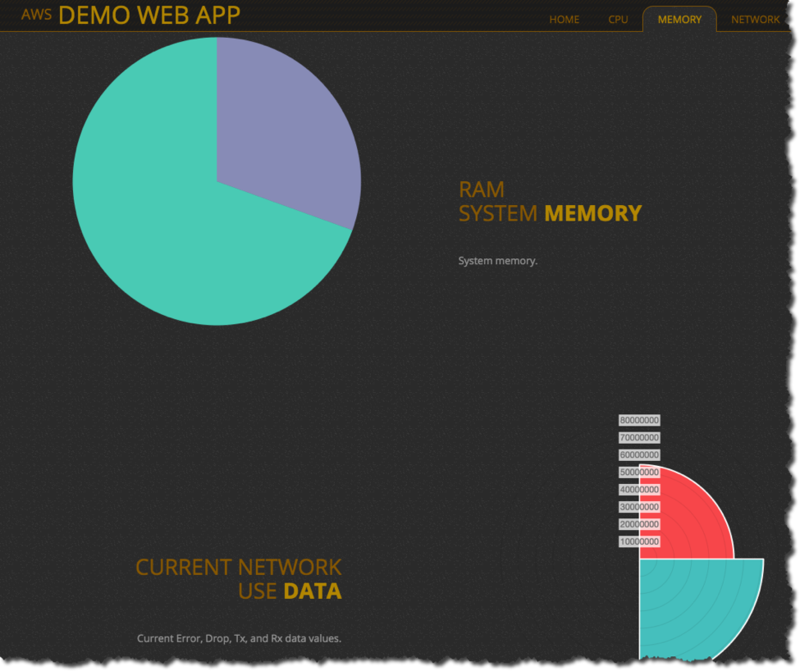 The demo app used in this artifact can be found here for Linux or here for Windows. From the AWS CodePipeline dashboard, under delivery-pipeline, choose Edit. Edit Source stage by choosing the edit icon on the right. Under Output artifacts, make sure My App is displayed for Output artifact #1. This will be the input artifact for the Build stage. The output artifact of the Build stage should be the input artifact of the Beta deployment stage (in this case, MyAppBuild). Choose Update, and then choose Save pipeline changes. On the next page, choose Save and continue. In TeamCity, on the Build Steps page, for Runner type, choose Command Line, and then add the following custom script to copy the source artifact to the TeamCity build checkout directory. Note: This step is required only if your AWS CodePipeline source provider is either AWS CodeCommit or Amazon S3. If your source provider is GitHub, this step is redundant, because the artifact is copied over automatically by the TeamCity AWS CodePipeline plugin. In Step name, enter a name for the Command Line runner to easily distinguish the context of the step. For Runner type, choose Command Line runner type, and then add the following custom script to copy the build artifact to the output folder. For Step name, enter a name for the Command Line runner. 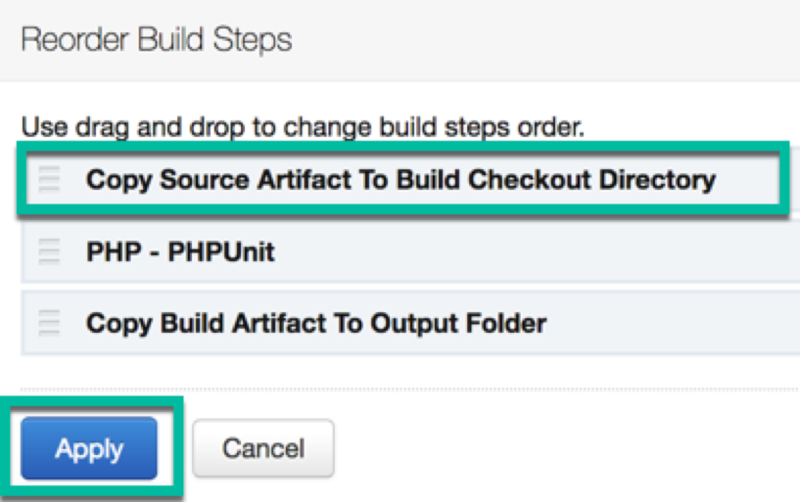 In Build Steps, choose Reorder build steps to ensure the copying of the source artifact step is executed before the PHP – PHP Unit step. 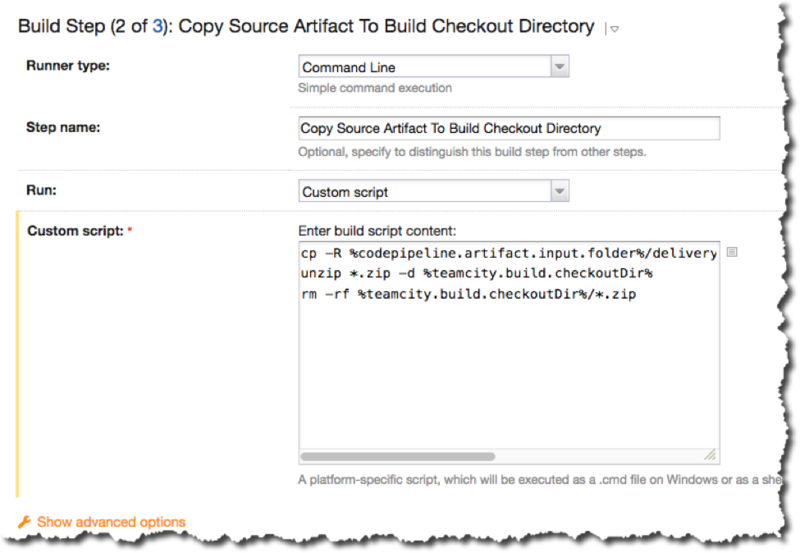 Drag and drop Copy Source Artifact To Build Checkout Directory to make it the first build step, and then choose Apply. 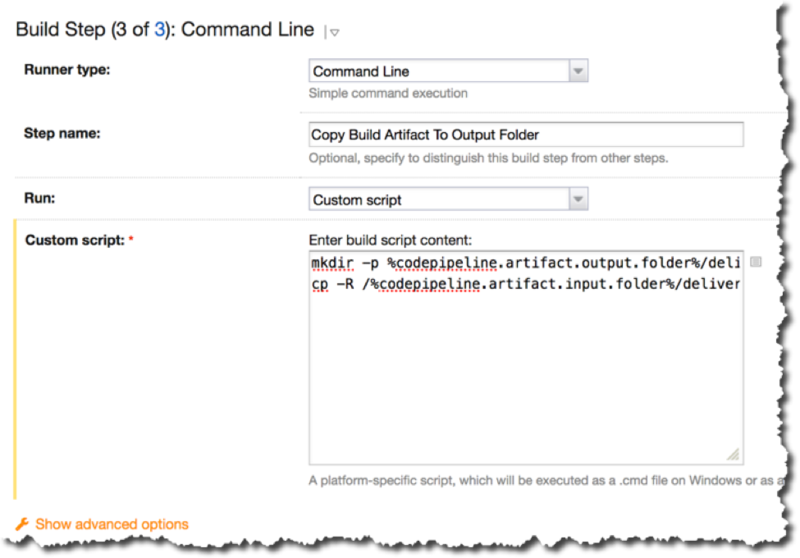 Navigate to the AWS CodePipeline console. Choose the delivery pipeline, and then choose Release change. When prompted, choose Release. Choose Release on the next prompt. The most recent change will run through the pipeline again. It might take a few moments before the status of the run is displayed in the pipeline view. Let’s access one of the instances to see the new application deployment on the EC2 Instance page. If your base operating system is Windows, accessing the public DNS address of one of the AWS CodeDeploy instances will result in the following page. If your base operating system is Linux, when we access the public DNS address of one of the AWS CodeDeploy instances, we will see the following test page, which is the sample application. Congratulations! You’ve created an end-to-end deployment and delivery pipeline ─ from source code, to build, to deployment ─ in a fully automated way. 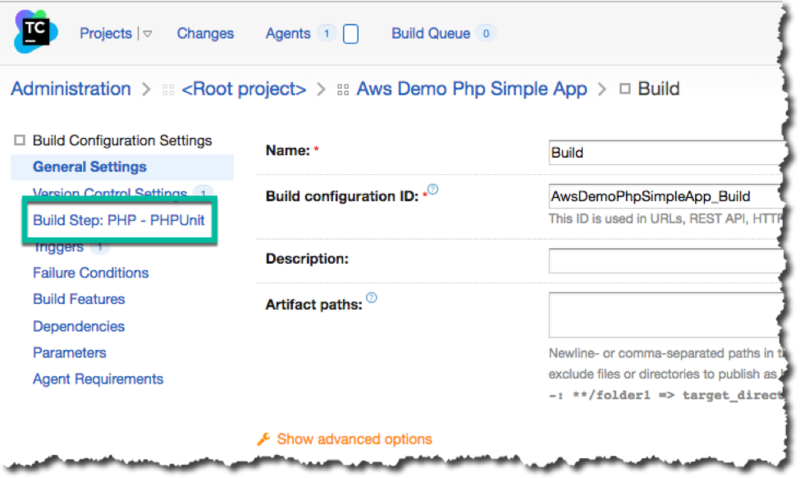 In this post, you learned how to build an end-to-end delivery and deployment pipeline on AWS. Specifically, you learned how to build an end-to-end, fully automated, continuous integration, continuous deployment, and delivery pipeline for your application, at scale, using AWS deployment and management services. You also learned how AWS CodePipeline can be easily extended through the use of custom triggers to integrate other services like TeamCity.